Settled in 1837, the town received a post office in 1846. The initial Anglo settlers were joined by a flood of German immigrants in the early 1880s. In the mid 1880s, Sempronius reported a population of 150 with businesses that included a steam-powered gristmill and a gin. The town also had a school and two churches. In the early 1880s, Sempronius suffered the fate of hundreds of Texas towns: death by railroad bypass. The railroad in this case was the Gulf, Colorado and Santa Fe. 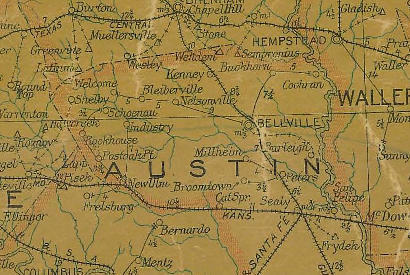 Sempronius was depopulated with some residents moving to nearby Kenney and others to Brenham, Bellville or beyond. In 1905 the town saw its post office close and the town was totally abandoned before 1920.